By placing my name here I am releasing Houston Vintage and the Air Terminal Museum of any liability. Entry Deadline: Deadline is November 1, 2018 OR when all 10 spaces have been confirmed. After submitting the form here and sending your payment (via paypal or check, please send a photo to HoustonVintageTX@gmail.com with subject line - Ms HV 2018 contestant application - your name. 1st place: $200 Cash, Involvement with community events throughout the year and showcased in Houston Vintage 2019 event. Tiger Flight "Vintage Kitty" - the recipient is chosen by Tiger Flight pilots Bloke Maurer and Rodney Horn and in addition to a trophy, will have the option to arrive at Houston Vintage 2019 in one of the Tiger Flight planes. It is my wish to participate in the Ms Houston Vintage 2018 Pageant, to be held on November 10, 2018, at the 1940 Air Terminal Museum located at: 8325 Travelair St Houston, TX 77061. I understand, appreciate, and acknowledge that property damage and injuries may occur at such events. I fully assume the risk of such property damage and/or personal injuries; I am participating in this pageant voluntarily and with my full knowledge of the inherent risks. I hereby waive and release any and all rights that either my heirs, successors and assigns or I may have against Houston Vintage (HTX Vintage, LLC ) their agents, staff, volunteers, and/or employees, arising from my participation in this event, including, but not limited to property damage and personal injuries. I further agree to indemnify and hold harmless all of theforegoing from any claim which may be made by me or on behalf by other third parties which might be made against me by others, arising from my participation in the foregoing event. This waiver shall remain valid and may not be unilaterally rescinded by the participant. In addition to the release and waiver of liability, by submitting this form I acknowledges that I have read and fully understand the Ms. Houston Vintage 2018 Rules. 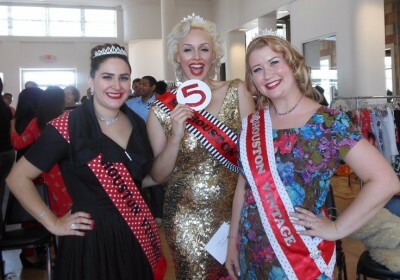 In addition, I give permission for my name, image, and photographs obtained of myself at event to be used to advertise current and future pageants for Houston Vintage, via social media, websites and possible publication of image and announcement of 1st place winner in local print papers. * Answers should not exceed one minute. This year's pageant is being sponsored by Kimono Zulu! Each participant will receive a beautiful vintage kimono courtesy of Kimono Zulu. 2. All Contestants must be at least 18 years of age or older. No exceptions. 3. Contestants must sign and submit application along with the waiver of liability form/release of photographs, in order to participate in event. 5. 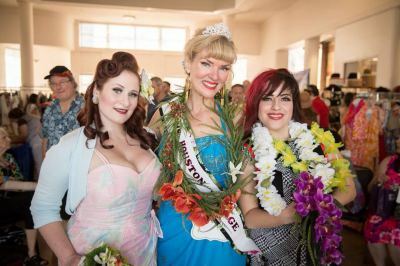 A panel of 3 judges will determine the 1st place winner and crown Ms. Houston Vintage 2018. Contestants will be judged on vintage outfit/attire, poise, confidence on stage, attention to detail, knowledge of their vintage ensemble and their own personal sparkle! ​Tiger Flight pilots Bloke Maurer and Rodney Horn are the judges for the Tiger Flight Vintage Kitty award. 6. A total of 10 contestants will be allowed to compete. Participants will be notified of acceptance. 7. Contestants are not entitled to a refund of entry fee paid to the pageant. Refunds of entry fee will only be given if the pageant is cancelled completely. 8. Ms. Houston Vintage 2018 pageant will start at 1pm, Saturday November 10th, 2018, at the 1940 Air Terminal Museum. All contestants must be on site (1940 Air Terminal Museum) by time requested (TBD) on the day of the event. Contestants will be notified of details at a later date.